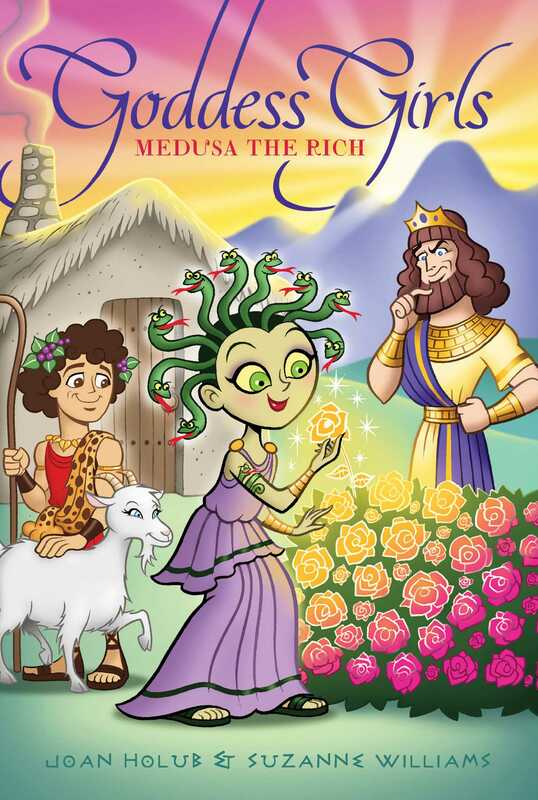 Medusa discovers that having the golden “King Midas” touch has its ups and downs in the sixteenth Goddess Girls adventure. When Medusa suddenly becomes able to turn objects into gold just by touching them, she is thrilled. Gold, gold, everywhere! But it’s not just objects that become golden—it’s also food, and, even people! Her new ability turns out to be more dangerous than delightful, but can she do anything to reverse it? SNAP! SNAP! SNAP! THE SNAKES on top of twelve-year-old Medusa’s head gobbled down the handful of dried peas she tossed up to them as she sat cross-legged on the floor of her dorm room at Mount Olympus Academy one Friday afternoon. Though her snakes had been the result of an accident with Snakeypoo, a botched invention of the brainy goddessgirl Athena’s—it had turned out to be a happy accident. Medusa adored the dozen snakes that had replaced her hair. She’d even given them all names: Viper, Flicka, Pretzel, Snapper, Twister, Slinky, Lasso, Slither, Scaly, Emerald, Sweetpea, and Wiggle! They were her pets now, and she couldn’t imagine life without them. Eager to help as always, her snakes wriggled their heads forward for a better look as she pulled out a comic-scroll and unrolled it. “Ooh! Remember this one?” The comic was one of her favorites, drawn after she’d given Zeus a winged horse named Pegasus on the day of his wedding. “It’s the one where Principal Zeus granted my wish to become immortal as a thank-you for my wedding present.” Zeus was not only the principal of MOA; he was also King of the Gods and Ruler of the Heavens, which meant he had the power to do such things. “I was immortal only for a single day. But still. Good times.” She sighed happily. Medusa shifted to lie on her stomach. The comic-scroll was titled The Queen of Mean (episode #25): Immortal for a Day. Starring her—as the Queen of Mean! In this episode the queen had gotten her chance to be a goddessgirl for one day, thanks to Zeus. Like almost all of her comics, this one was autobiographical—loosely based on things that had happened to Medusa in real life. The queen looked like her and was a superhero who used something called payback magic to get even with dastardly evildoers. A magic cheese was one of her coolest—and stinkiest—weapons. Medusa went on, switching back and forth between a normal narrator voice and the queen’s voice. All the while her snakes gazed intently at her drawings. Medusa paused, feeling a little pang of disappointment. Why couldn’t it really be that way? But no, in real life her parents’ tossing out her sisters’ pictures and hanging a big one of her was probably the least likely thing in the comic to ever really happen. Her parents had always favored her two sisters—who were actually named Stheno and Euryale—over her. Probably because her sisters were immortal and she wasn’t. In her comic-scrolls she could remake the world however she wanted. Which meant she could be an immortal superhero with parents who adored her! “?‘When the queen returns to Mount Olympus Academy that night, exhausted from her crime fighting, the four most popular goddessgirls at MOA—Athena, Persephone, Aphrodite, and Artemis—run over to her. SNAP! Medusa let go of the comic-scroll, and it rolled itself back up. Smiling to herself, she pushed up to sit cross-legged again and then pulled up on the delicate gold chain around her throat. She ran her fingers over the sparkly gold, swirly letters of the QoM charm dangling from it. Though not everything she’d imagined herself doing on her day as an immortal had actually happened in real life, Hephaestus really had made this charm for her. And she’d flown in winged sandals all by herself too. And that cute boy Dionysus had become her crush! People often asked her what the QoM charm stood for, but she’d never told anyone, not even Dionysus. It was her secret. Ha-ha-ha! Though that secret would soon be out if, by some huge miracle, she really did win the Comicontest. It was sponsored by a group called Big D Publications. The prize was a publishing contract! Which she figured meant that Big D would make many copies of the winning comic collection to sell as scrollbooks in stores. The scrollbooks would probably end up in libraries everywhere too! Then everyone would know about the Queen of Mean. Would they guess Medusa was really writing about herself? Probably. But who cared! Winning meant she’d be famous. And hopefully rich! “So what do you think?” she asked her snakes. Curling forward so she could see them better, they bunched themselves into a giant fist with only Slinky sticking straight up—their version of a thumbs-up. She grinned. “Thanks, guys.” Of course, they liked every comic she drew, especially the ones they starred in. And there were many of those. She frowned at her comic-scroll drawings. They were better—certainly more detailed—than the mostly stick figures with big O-shaped heads that she’d drawn at age six. But were they good enough to win the contest? Hmm. She tapped her chin with a fingertip, thinking. She didn’t have much time. Entries had to be put in the contest box that sat in the center atrium at the Immortal Marketplace by tomorrow! There was another problem too. As usual she was practically broke. No way could she cover the fifteen-drachma entry fee. She let out a huff. Sensing her frustration, Flicka, Pretzel, and Sweetpea dropped down to gently wind themselves around her neck like a collar. Slither, Emerald, and Wiggle nuzzled her cheeks. Her other six snakes patted the top of her head soothingly. “Thanks, guys. You always know how to make me feel better,” Medusa told them, smiling a little. Huh? She jumped in surprise when a sharp knock came at her door. Ye gods! Medusa had forgotten all about that. Probably because this particular job wasn’t something she’d wanted to remember. “Coming!” she called back. Leaving her scrolls in the middle of the floor, she reluctantly got to her feet and left her room. If only she could win that contest. It would prove to everyone at MOA that although she didn’t have immortal gifts, she did possess some creative talent. And then maybe even her sisters would treat her with more respect. All she needed was some inspiration for a phantasmagoric, awesomerrific, super-dupertastic idea for that tenth comic. And she needed it fast!